This text was copied from Wikipedia on 12 January 2019 at 6:01AM. Nonsuch Palace /ˈnʌnˌsʌtʃ/ was a Tudor royal palace, built by Henry VIII in Surrey, England; it stood from 1538 to 1682–83. Its site lies in Nonsuch Park on the boundaries of the borough of Epsom and Ewell in Surrey and the London Borough of Sutton. Nonsuch Palace in Surrey was perhaps the grandest of Henry VIII's building projects. It was built on the site of Cuddington, near Ewell, the church and village having been destroyed and compensation paid to create a suitable site. Work started on 22 April 1538, the first day of Henry's thirtieth regnal year, and six months after the birth of his son, later Edward VI. Within two months the name 'Nonsuch' appears in the building accounts, its name a boast that there was no such palace elsewhere equal to it in magnificence. Construction had been substantially carried out by 1541, but it took several more years to complete. As the Royal Household took possession of vast tracts of surrounding acreage, several major roads were re-routed or by-passed to circumvent what became Nonsuch Great Park. The palace was designed to be a celebration of the power and the grandeur of the Tudor dynasty, built to rival Francis I's Château de Chambord. Unlike most of Henry's palaces, Nonsuch was not an adaptation of an old building; he chose to build a new palace in this location because it was near to one of his main hunting grounds. However the choice of location was unwise, as there was no nearby supply of water suitable for domestic use. The palace cost at least £24,000 (£104 million in 2009) because of its rich ornamentation and is considered a key work in the introduction of elements of Renaissance design to England. The palace was incomplete when Henry VIII died in 1547. In 1556 Queen Mary I sold it to Henry FitzAlan, 19th Earl of Arundel, who completed it. It returned to royal hands in the 1590s. Following Parliament's victory in the English Civil War, the Nonsuch estate was confiscated and given to General Thomas Pride, who held it until his death in 1658. The palace was handed back to the Crown after the Restoration in 1660 and remained royal property until 1670, when Charles II gave it to his mistress, Barbara, Countess of Castlemaine. She had it pulled down around 1682–3 and sold off the building materials to pay gambling debts. Some elements were incorporated into other buildings; for example the wood panelling can still be seen today in the Great Hall at Loseley Park. No trace of the palace remains on its site today but some pieces are held by the British Museum. There is a discernible rise of land where the old Cuddington church used to be, before it was demolished to make way for the palace. Nonsuch Palace should not be confused with Nonsuch Mansion, which is at the east of the park, nor its associated banqueting hall whose foundations are still visible to the south east of the palace site. In 1585 the Treaty of Nonsuch was signed by Elizabeth I of England and the Dutch Republic at the palace. Only about three contemporary images of the palace survive, and they do not reveal very much about either the layout or the details of the building. The site was excavated in 1959–60; the plan of the palace was quite simple with inner and outer courtyards, each with a fortified gatehouse. 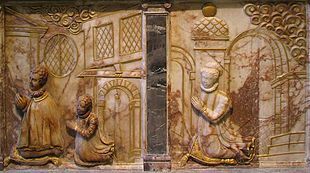 The exterior and outer courtyard were quite plain, but the inner courtyard was decorated with breathtaking stucco panels moulded in high relief. To the north, it was fortified in a medieval style, but the southern face had ornate Renaissance decoration, with tall octagonal towers at each end. It was within one of these towers that the premiere of Thomas Tallis' masterwork, Spem in alium, was perhaps performed. Following the digging of the trenches in World War II, it was reported that pieces of pottery had been discovered in the area, later found to be from the site of the palace. An outline of the site layout was also visible from the air, providing additional evidence in the search for the location of the site. The 1959 excavation of Nonsuch by Martin Biddle was a key event in the history of archaeology in the UK. It was one of the first post-medieval sites to be excavated, and attracted over 75,000 visitors during the work. This excavation led to major developments in post-medieval archaeology. John Speed's 1610 map of Surrey also shows the palace's gardens with the principal ornaments. John Speed's map of Surrey has an insert depicting the palace and a part of its gardens, including some of the principal ornaments. These are also known from detailed drawings in the "Red Velvet Book", the 1590 Lumley inventory. ^ Davies, Godfrey (1959). The Early Stuarts, 1603–1660. Oxford History of England: Oxford University Press. p. 273. ISBN 0-19-821704-8. ^ David Gaimster. "Great sites: Nonsuch Palace". British Archeology. Archived from the original on 2001-11-22. Retrieved 2006-12-31. In 1959, the year Martin Biddle first excavated Henry VIII's vanished palace of Nonsuch in Surrey, the concept of post-medieval archaeology was virtually unknown. Within a decade the subject was established with its own academic society, and post-medieval sites were being investigated and rescued in their own right. Today the subject is routinely taught at universities, and archaeologists are increasingly specialising in the period which spans the transition between medieval and industrial society. Dent, John (1970) . Quest for Nonsuch (2nd ed.). Hutchinson. ISBN 0-09-105140-1. Biddle, Martin (2005). Nonsuch Palace: The Material Culture of a Noble Restoration Household. Oxbow Books. ISBN 978-1-900188-34-0. Biddle, Martin (Summer 1999). "The Gardens of Nonsuch: Sources and Dating". Garden History. 27 (1): 145–183. Wikimedia Commons has media related to Nonsuch Palace. Very nice park still today, and still on the road to London from Epsom (get the bus to Morden or vice versa...). Nonsuch Palace was commenced by Henry VIII., and finished by the Earl of Arundel. From Lord Arundel Nonsuch passed to Lord Lumley, who subsequently sold it to Queen Elizabeth. James I. settled the palace and park on Anne of Denmark, as did Charles I. on Henrietta Maria. At the Restoration the palace was restored to the Queen Dowager. During the plague year of 1665 the house was fitted up for the offices of the Exchequer, and in 1670 it was granted by Charles II. to the Duchess of Cleveland, who pulled down the palace, and converted the park into farms.